One reason to file a 13 is because a Chapter 7 is not available. Debtors who filed a Chapter 7 that successfully received a discharge in the last 8 years cannot again file a Chapter 7. Some debtors make too much money to qualify for a Chapter 7 due to the means test. Another reason to file a 13 is because you might otherwise lose property if you filed a Chapter 7. When you are behind on your mortgage payments, a Chapter 7 will not solve that problem and thus may not stop an eventual foreclosure. When you are behind on your car payments, the lender may still repossess the vehicle after or during a Chapter 7 if you do not get current on the payments. Another good option for a 13 is when you own non-exempt property that a Chapter 7 trustee would take to pay money to your creditors, as you can keep the property by paying for it over the life of the 13. The 13 allows you to make payments over a three to five year period in which you will make all mortgage payments as they become due after you file plus catching up on the missed payments such that by the end of the 13 you become current and can thus keep your home. In a 13, you will pay off the amount owed on the car loan such that how far behind you were before filing bankruptcy does not really matter. Sometimes you can keep a car or other secured property by paying what the car is worth even if that is less than what you owe, but that is limited to car loans taken out more than 910 days before filing or on loans taken out for a business and not a personal reason. Divorce decrees and property settlements from a divorce can create an obligation to divide up property or pay money to the ex-spouse that is not in the nature of child support or alimony but simply a division of property. While that obligation cannot be eliminated in a Chapter 7, it can be discharged in a Chapter 13. Paying off priority taxes, generally those due in the three year prior to filing, is a great strategy in a Chapter 13. This is because while those debts are not discharged in a 7 and thus must still be paid after the 7 ends, the 13 can propose to pay off those taxes over several years. The great advantage of a 13 is that the penalties are removed and discharged, and the interest stops as of the date of filing and goes to zero for the life of the 13 Plan. It is easier to hit a target when it quits moving, and so a 13 can be a great way to deal with taxes that would be unmanageable to pay after a 7 ends. Student loans are not dischargeable in either a 7 or a 13, but as long as the 13 lasts, three to five years, the student lender has to sit back and either be paid nothing at all or what is available for them as a share of other unsecured creditors. If you can afford to continue to pay your student loans during a 13, that is generally a good idea as the interest does continue to accrue and increases your total debt. However, sometimes folks just need a several year breather from the student loan payments that a Chapter 13 can provide. 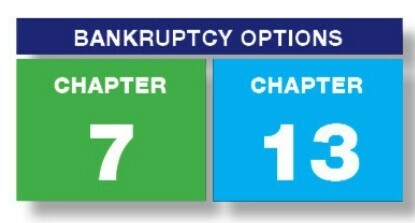 Often times Debtors are able to take out debt as needed during a Chapter 13. I once filed a 13 for a young man who was renting. About a year into his bankruptcy, by proving he had made all his plan payments on time, he was able to obtain a mortgage to buy his first house at a very competitive interest rate of 4% that was lower than I was paying on my own mortgage at the time. I have had mortgage brokers advise me it is sometimes easier to refinance a mortgage while still in a 13 than after it ends. So, while a 13 is more involved than a Chapter 7, sometimes that can be much better for you than the simpler Chapter 7.